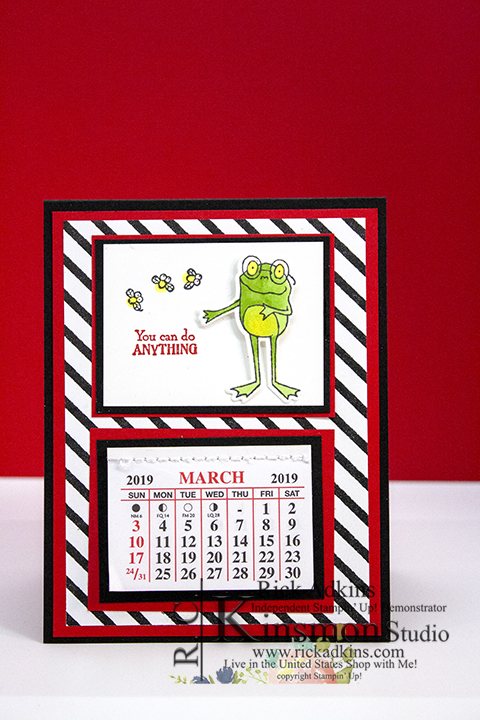 Hello and welcome to my blog; today I am going to share with you the card that my friend Kathy Jenkins designed. She gave me one of these cards and one other for my birthday. 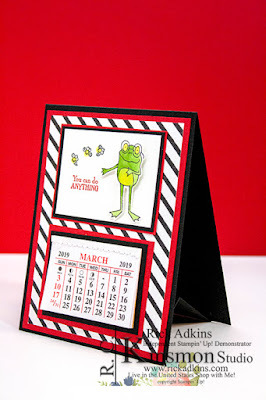 She taught her monthly card club how to create this same easel card in February. We also attend another friends team meeting and each person that comes takes turns doing a project and she shared this with everyone this month. This is the card that Kathy gave me for my birthday, if you notice in the picture of her card above you will see my birthday circled. 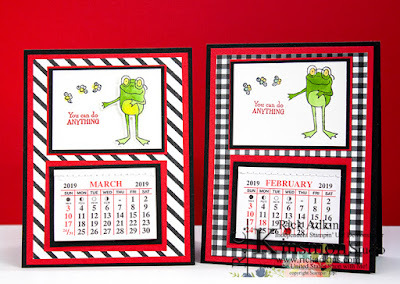 I did my version of her card Wednesday night during my Facebook Live this week. I's actually a very easy card to create, as you all know I love cards that are easy to create but look very impressive. 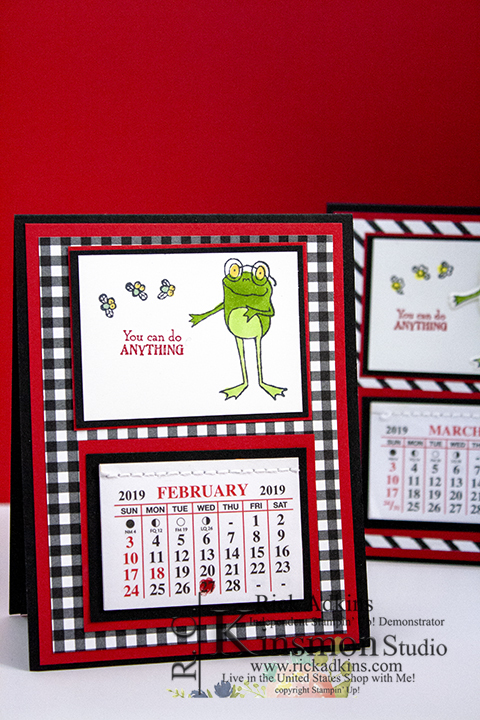 She got her little calendars at her local pharmacy. They actually gave her them after they handed out all they could before the New Year and still had a surplus. This is the version that I created with the supplies she brought to the downline meeting Monday night. 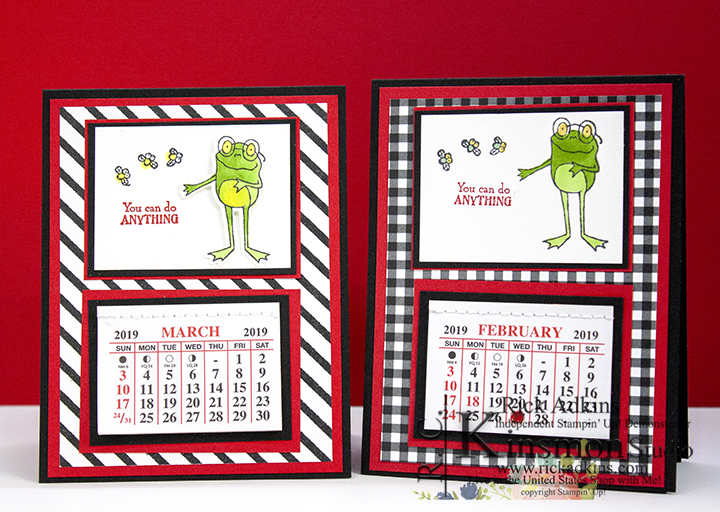 Kathy stamped the frog on the little panel at the top while I stamped mine on a additional piece of cardstock and then used the sold out matching Saleabration Coordination framelits and cut it out. I then popped it up on the card using a couple stampin' Dimensionals. You can download a PDF tutorial of this card by clicking here. You can also watch the tutorial that I did on Wednesday by clicking on the video below. I loved this card so much that I had to share it with all of you. I mentioned that Kathy got her calendars at her pharmacy but you can find them online in multiple places. I know that you can find them on Amazon. Thanks for dropping bye today and I hope that you have enjoyed my card today, and that you will give it a try. You will find a full list of the supplies used in the shopping list below. You can order in my online store 24/7 by clicking on the shopping tab above or by clicking on the product in the list below. Remember to use my host code for a special gift with orders of $50.00 (before shipping & taxes).